A few years ago, while meditating in the caves at Indian Hot Springs, I envisioned a buffalo. I’ve had other animals float through my head before — a wolf and a heron come to mind — but the buffalo have stuck around. I’ve been within 50 feet of buffalo three times in the past week. I’ve been drawn to them. I don’t think it’s coincidental. Based on some research I’ve done (in the past ten minutes), I’ve learned that when the bison shows up in your life, it suggests you will achieve some major goals soon. 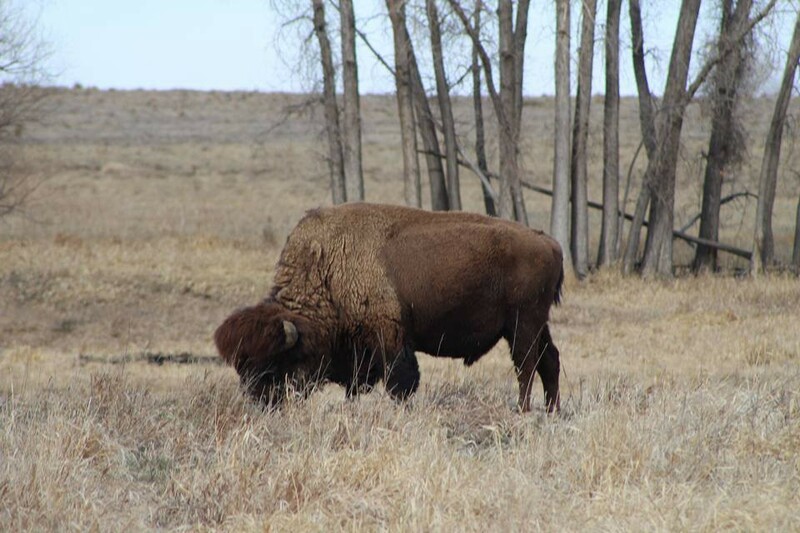 The bison also serves as a reminder not to get angry or impatient, and to believe more in oneself and one’s abilities, because you are on the right path, and something good is on the horizon. This morning, I went to church. Barry Ebert, the amazing guy who runs the youth program, led the service. He spoke of intuition and trusting ourselves. A girl who couldn’t have been much older than my daughter also sang Don’t Worry Be Happy while playing a ukulele during the service. And again, my weird yearning to learn the ukulele is rekindled. Then, I came home, felt sick, and slept for hours. Upon waking, I knew I needed to see the buffalo. The Rocky Mountain Arsenal National Wildlife Refuge is less than 30 minutes from our home, and it’s just the most magical, amazing place. I particularly love that it is so close to the city. Amidst all that noise and frenetic energy of metro Denver is this peaceful haven full of mule deer, bison, prairie dogs, and chirping birds. It’s so quiet and simple. It’s the eye of the storm, I suppose. Taken three weeks ago at the RMANWR. PS — not pregnant. No uterus. Dreams I’ve had since I was in high school are right there in front of me. I’m in the process of becoming the woman I wanted to be when I grew up. And I am SO SCARED. It’s late and I’m tired. There was supposed to be some kind of transition from the mention of new life in April and May and a metaphor for the birth of my authentic self, blah blah, so I guess here it is. Ahhh, the majesty of words. The buffalo on the prairie are keeping me grounded right now, mostly. I’ve been running rampant in my mind, and it’s been exhausting. Here’s to slowing down, changing, and running into the storm. I really need to meditate more often. Embracing change. I’m a storyteller, humorist, writer, and performer.